Our roster of artists for this year’s body painting competition is amazing. Each year, I am humbled by the breadth of the talent that decides to participate in the Art World Expo, but also so proud of those who choose to compete. Being in a competition is hard work and can be nerve wracking. As an artist, it is also so very courageous to put your work, your ideas and yourself out there for people to judge. 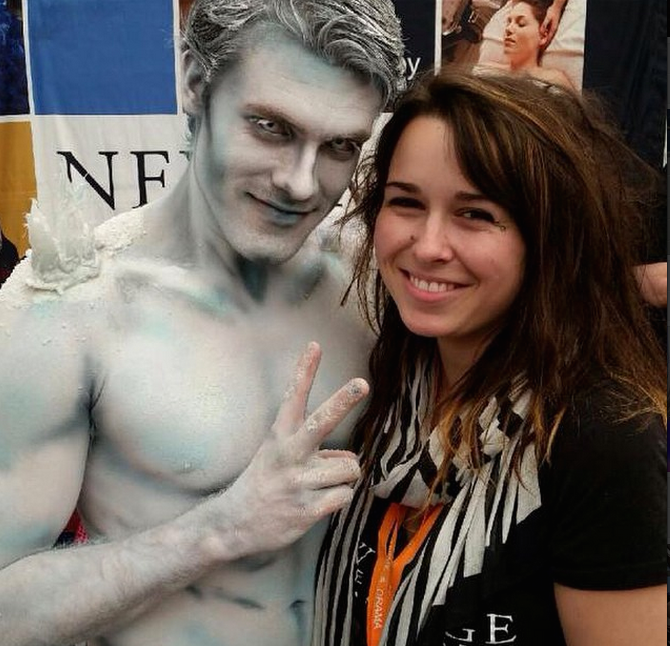 Today, I interview one of the body painting contestants to learn a little more about her background and reason for making art! 1-What is your inspiration for doing make up? I do not consider myself a make up artist. I am and was trained as a conceptual and fine artist and in fact as I enter the world of body painting, I realize how much I have to learn from, and of make up. Though I do approach a body painting project differently than a traditional canvas painting, I still consider it painting, maybe even more so because I actually spend a lot of time preparing so that I get the best out of my model, not wasting her precious energy of being here, physically and mentally. I love the ephemeral component and the fact that it is a near umbilical cooperation between an artist and model, a living breathing feeling canvas. And the possibilities for incredible art are boundless. 2-You sold your business and have been working full time as an artist. How do you think owning a business has helped you become an artist today? My former business was in the service industry, a service in high demand, I have a lot of experience in various service industries and I did not have to market myself, it was a residual effect of the service (janitorial). And I was able to create a word of mouth revenue stream which I find to be hard to reproduce in monetary terms when applied to the art world. However, Vancouver offers a lot of volunteering and cooperative opportunities for artist as it houses a vast number of gifted artists. I am currently researching possibilities for being represented professionally. 3-Do you think that growing up in a different country gave you different perspective as an artist? I was taught from a very early age to show utter respect to mother nature. It was a simple yet essential existence and I like to think that this simplicity and essential-ness is what I often bring to my fine art . 4-What is your favourite piece of work that you have made so far? In body painting, I do not have a favorite piece of work, and I adore that about it. Each experience is so unique and beautiful and has brought me complete joy. One of my latest favorite oil painting is visible on my website www.boiseartworks.com and is called “Splash”. 5-Where do you see yourself in 5 years time with your artistry? My dream is to be able to make a sustainable living doing what i love doing, body painting and art. I think my skills as a conceptual and applied artist and my experience in various service industries are an asset to work on long haul body painting conceptual projects for the advertisements, magazines and media. 6-If you had advice to aspiring make up artists, what would you tell them? My life has been a fortunate road with many horizons and possibilities. It has led me here, living in this Canadian land that has adopted me and that I have adopted. From my childhood in the highest inhabited region of the French Alps to the shores of Vancouver, I had the privilege to live in various countries and meet amazing individuals. Every time collecting new experiences, knowledge and perceptions along with a couple languages.I attended the French National Fine Art School in the 80’s and learned classic and conceptual arts. Until recent years, most of my artistic efforts were geared towards my children and my hobbies, awesome Halloween costumes, sculpted birthday cakes, flamenco dresses, custom made bead jewels etc. In 2011, after selling my small business, I decided to fulfill my dream of being a committed artist. I have produced, sold and exhibited number of pieces in shop settings, various artistic events and markets such as Lab Art, Vancouver Home and Design Show, and Commercial Street Café. I currently exhibit oil paintings at Float Sense in Burnaby. Eight months ago, I started to paint doodles on my friend’s bodies at the beach. I knew right away I wanted to realize complex body painting projects. And that is what I did! It has been so far, a rich and fulfilling endeavor and I wish to continue growing in that amazing medium that gives me great satisfaction. Ephemeral Art has always been one form I cherish and want to give my artistic soul to. I am very excited to participate to the AWE 2017 body painting competition, which is my second competition so far. Thank you to all who attend and participate!